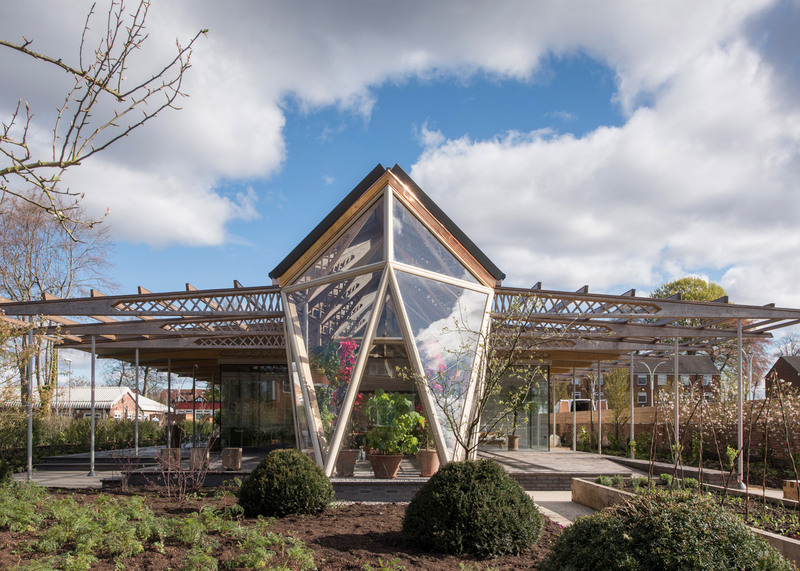 Norman Foster has completed a Maggie's Centre for cancer care in his home town of Manchester, featuring a timber-lattice structure, an angular greenhouse and a flower garden (+ slideshow). The Foster + Partners founder, who won a battle with bowel cancer over a decade ago, designed the healthcare building for The Christie hospital in Manchester, and it officially opens today. 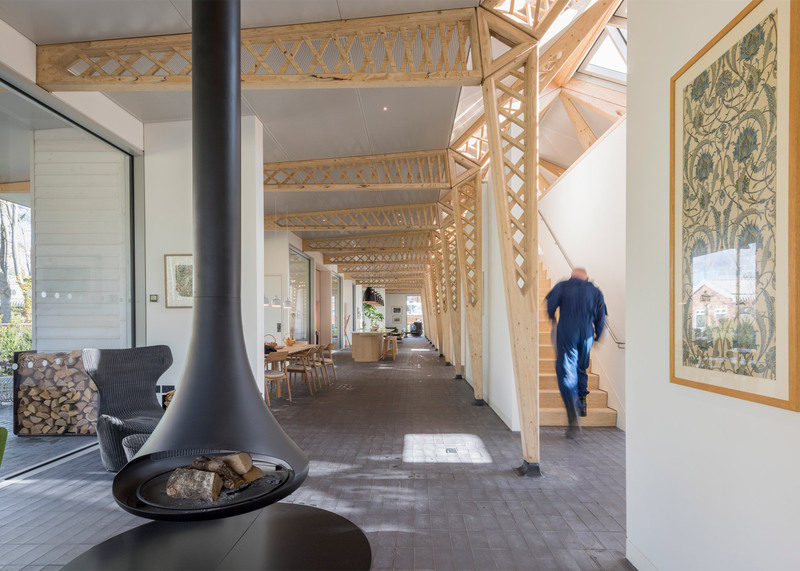 Like the 18 Maggie's Centres already established in the UK – designed by architects including Snøhetta, OMA and Richard Rogers – it offers a non-clinical environment where anyone affected by cancer can stop by for advice or support. "I have first-hand experience of the distress of a cancer diagnosis and understand how important Maggie's Centres are as a retreat offering information, sanctuary and support," said Foster. Symmetrical in plan, the building is largely arranged over a single storey to match the scale of its neighbours, but its roof angles up at the centre to create a slender mezzanine. 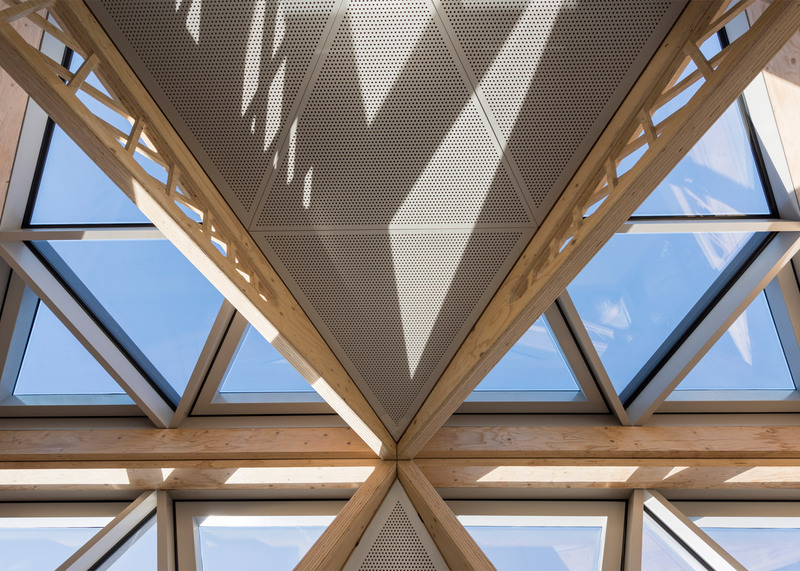 The layout is dictated by the intricate timber structure, which comprises a network of tapered wooden columns and beams, each supported by angled crossbeams that form zigzagging patterns. 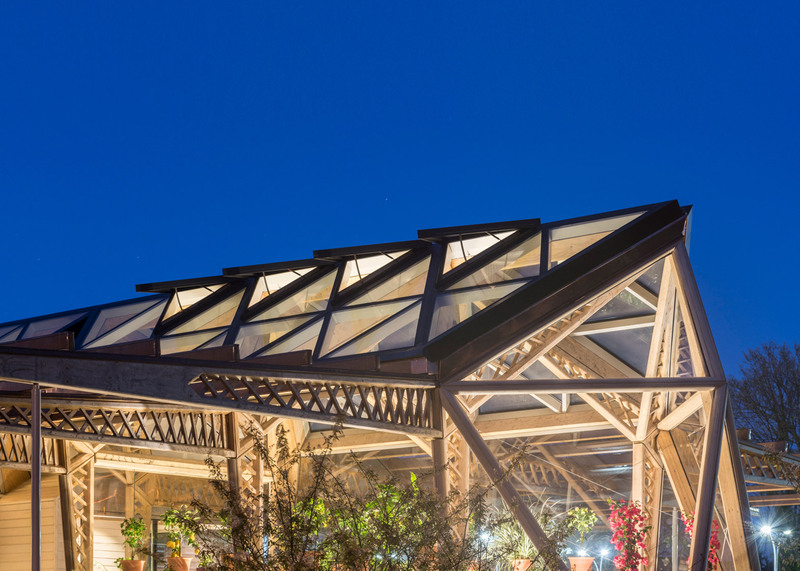 "The timber frame, helps to connect the building with the surrounding greenery – externally, this structure will be partially planted with vines, making the architecture appear to dissolve into the gardens," said Foster. Window walls run along all sides of the building, offering views out into the garden, while triangular skylights allow light to filter into the mezzanine rooms, where offices are located. Rooms on the ground floor are designed to appear domestic in scale. Treatment and counselling rooms are located along the eastern facade, and each faces its own private garden – all designed by landscape architect Dan Pearson. The greenhouse is located at the sunny south-facing end of the building, inviting patients to grow flowers and other produce. There is also a library, exercise rooms, and a kitchen. "Our aim in Manchester, the city of my youth, was to create a building that is welcoming, friendly and without any of the institutional references of a hospital or health centre – a light-filled, homely space where people can gather, talk or simply reflect," explained Foster. 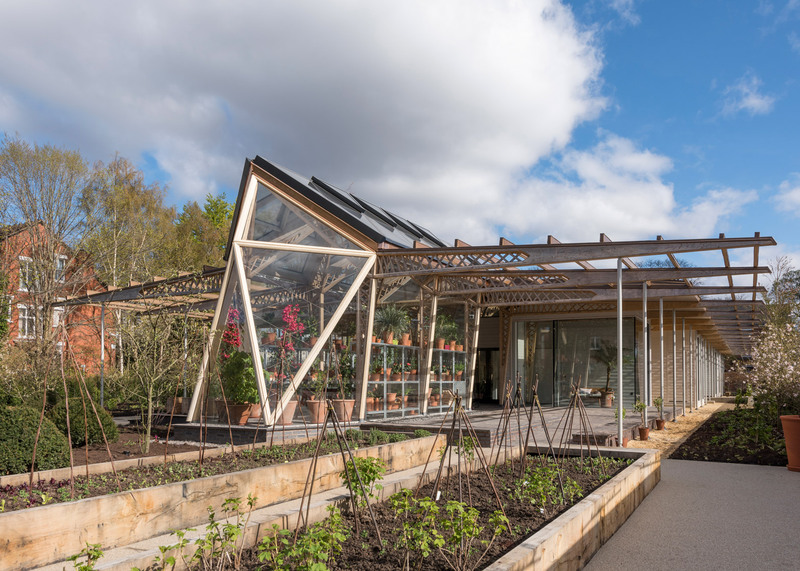 "That is why throughout the building there is a focus on natural light, greenery and views; with a greenhouse to provide fresh flowers, and an emphasis on the therapeutic qualities of nature and the outdoors," he added. Foster worked with Mike Holland – who leads the firm's industrial design team – to design all the furniture for the kitchen. Like many of the other Maggies's Centres, it forms the heart of the building, allowing visitors to sit down around a large table. Other details also reinforce the homely aesthetic. Walls are painted white and decorated with framed artworks, and one of the seating areas is arranged around a wood-burning stove. Tiles cover the floors inside the building, and also extend out to a generous west-facing veranda, sheltered from the rain by the overhang of the roof. The Maggie's cancer charity was founded by the late Maggie Keswick Jencks and her husband, architecture theorist Charles Jencks, to offer support to cancer sufferers and their relatives. Foster first unveiled his design for Maggie's Manchester in early 2014. 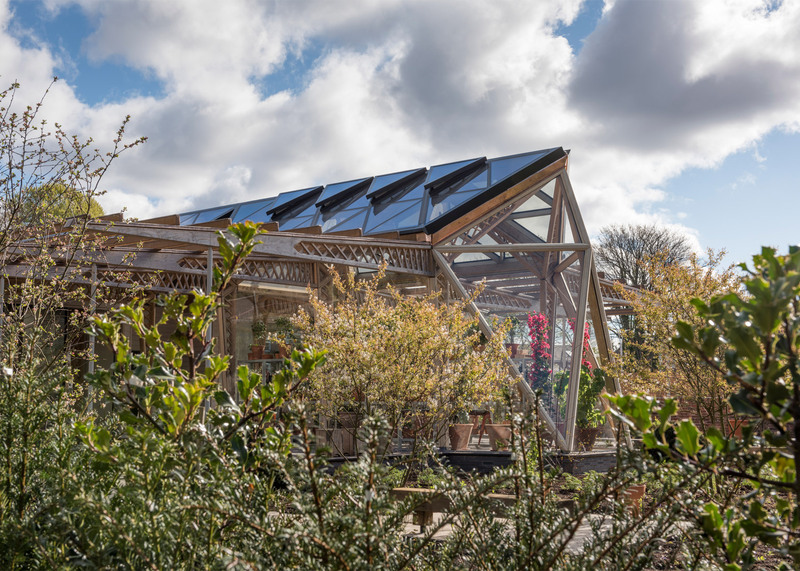 Since then, architect Amanda Levete and designer Thomas Heatherwick have also revealed designs for Maggie's Centres. A new centre by American architect Steven Holl is also underway at London's St Bartholomew's Hospital. Photography is by Nigel Young/Foster + Partners.